AVAILABLE IN A CANNED FORMULA AND 2 DRY FORMULAS CANNED FORMULA - Original DRY FORMULAS - with Chicken - with Tuna INDICATIONS Science Plan* Feline Light Adult is formulated for adult cats needing fewer calories (less active, neutered or obesity-prone). Providing a nutritionally-balanced food with reduced energy density helps control body weight, and replacing digestible calories with indigestible fibre increases bulk and helps to avoid hunger. L-carnitine supplementation (dry) ensures adequate levels to help limit fat deposition and maintain lean body mass. Science Plan Feline Light Adult aids in the prevention of onset of clinical signs associated with feline lower urinary tract disease (FLUTD) and the dry formula also contains a Superior Antioxidant Formula to reduce oxidative cell damage. NOT RECOMMENDED FOR 1. Kittens. 2. Pregnant and lactating queens. 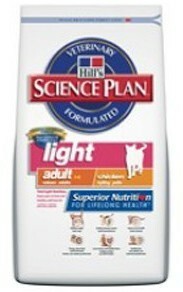 During pregnancy or lactation queens should be switched to Science Plan* Kitten.